Latinos are often presented as a monolithic voting bloc but contrary to what many politicians and the media would have you believe, we know that Latinos are complex, diverse demographic that spans the political spectrum. We often see political campaigns using immigration as the issue to motivate Latino voters – this year’s presidential debates have highlighted immigration on both sides of the aisle. But while Latinos care deeply about immigration reform, it isn’t the only issue affecting Latinos. In fact, recent polls, including one by the Pew Research Center, point to many of the same issues the populace as a whole considers important: education, the economy, and healthcare. Leading into California’s primary this June, Oye Mi Voz is taking a deeper look at the complexities of Latino voters, particularly how California’s Latinos are affected by different issues. 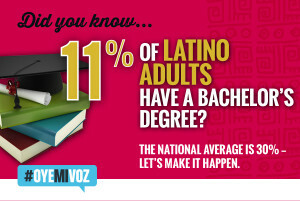 This week we took a look at a couple of key Latinos educational achievement statistics. Though the numbers aren’t all bleak, they aren’t exactly inspiring. It’s clear that while the education achievement gap is getting smaller there is much progress to be made. 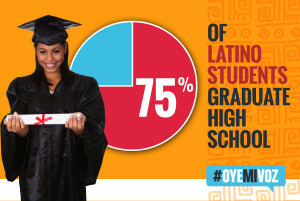 Latino high school graduation is at 75%. And even though more Latinos than ever before are entering college, only 11% of Latino adults have a Bachelor’s degree while the national average is 30%. That’s not enough! We need to invest in policies (and the politicians who can implement them) to better reflect the educational needs of Latino students and ensure more equitable educational access. We’d love to hear your thoughts, experience, and hopes for improving these numbers – please join the conversation on Facebook and Twitter and let us know what you think. In the midst of the 2016 elections, let’s expand the public conversations and debates that our candidates are having. Let’s demand that they start paying attention to the all the issues and needs of the Latino community. And then let’s show them that we matter. Make sure you and your family and friends are registered to vote. Help us to turn out the vote for the candidates that will best represent our interests on immigration, education, the economy, health care and much more. Together we shift the national dialogue, demand legislation that works in our favor and change these statistics to mirror the change we seek. Let’s do this!